Nga Purapura was definitely the place to be on the afternoon of Sunday 23 November. 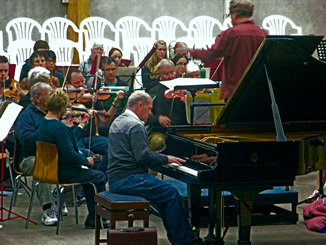 The occasion was a concert celebrating the 10th Anniversary of the Kapiti Concert featuring internationally acclaimed New Zealand pianist Michael Houstoun as guest soloist. The Kapiti Chamber Choir and the Kapiti Chorale also joined the Orchestra for this special concert which attracted a sell-out audience of over 850. The concert opened with the 60 piece Orchestra playing Mendelssohn’s Hebrides Overture under the baton of Kenneth Young. Then Michael Houstoun took centre stage to perform Grieg’s Piano Concerto No. 1 on the 9 foot grand piano, a Steinway, brought from the Wellington Town Hall especially for the occasion. Grieg’s piano concerto is one of the most popular ever written and it was easy to see why as it came to life filling the huge space of Nga Purapura’s auditorium with such wonderful music through the beauty of Michael Houstoun’s playing. After prolonged and enthusiastic applause, Michael returned to the piano to play an encore — Bach’s Prelude No 1. The second half of the programme belonged to the Chamber Choir and the Chorale. The Kapiti Coast is indeed fortunate to have two choirs of such high calibre and they treated the audience to a great selection of music both on their own and with the Orchestra. The concert concluded with an arrangement of O Come All Ye Faithful. What a wonderful way to end such an enjoyable concert. The Orchestra was delighted to have celebrated its first 10 years in such great style.